The Guidebook, when revised, will be posted here. On April 3, 2004, Hilde Schwartz and Casey Moore (U.C. 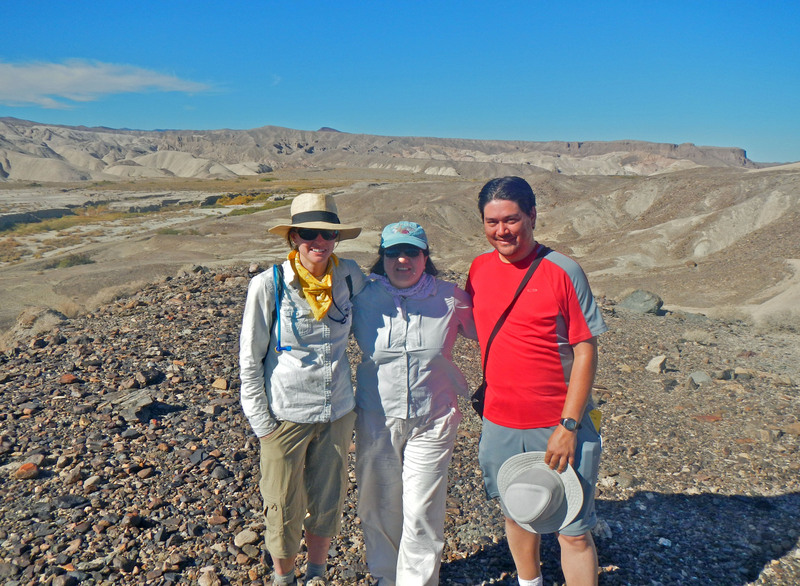 Santa Cruz) led a joint PGS/UCSC Hellatite field trip to the Panoche and Tumey Hills, NW San Joaquin Valley. On June 1, 2, and 3, 2002, Gary Ernst (Stanford University) and Mike Diggles (U.S. Geological Survey) led a three-day field trip to the White-Inyo Range in Mono and Inyo counties on the eastern edge of the Owens Valley in eastern California. David Howell led a field trip to the Napa Wine Country on December 2, 2001, that was a preview of a forthcoming book by Jonathan Swinchatt and David Howell, The Winemaker's Dance. including a link to the revised 19-page field guide and a photo album. The trip was in May, 2001 and the revised field guide came out in June. including a link to the revised 214-page field guide and a photo album. The trip with an early field guide was in May, 2000 and the revised field guide came out in May, 2001. I don't have a field guide for this trip but there is a good one linked below from an earlier trip. This report is 35 pages long (830 kb PDF file). April Wood at the California Geological Survey Library started this job with her reprint request. Phil Garbutt at Cal State Hayward got a copy from Woody for us. Mary Jane Coombs scanned and OCRed the report in May, 2002. 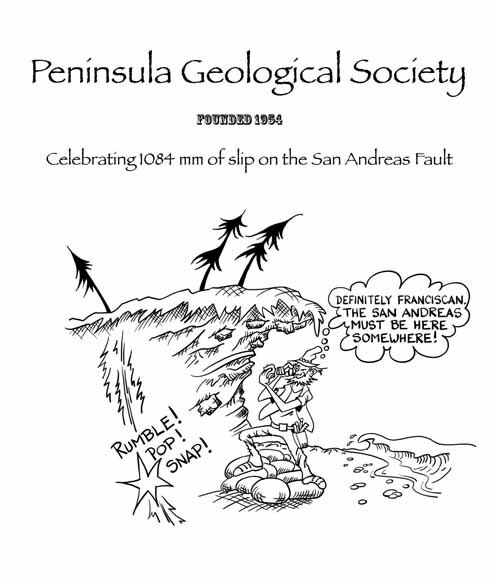 The Peninsula Geological Society (PGS) was formed in 1954 as a group of scientists who focus on the San Francisco Peninsula in particular as well as San Francisco Bay Area, California, and western Cordilleran geology in general. We meet about monthly during the academic year as well as have two or three field trips a year. The operation of PGS is mostly run out of the USGS in Menlo Park and the Stanford University School of Earth Sciences. Our meetings are usually dinner meetings and are commonly held at Stanford University in Palo Alto. Other institutions that are closely, or at least loosely, involved with PGS include Cal State East Bay, U.C. Berkeley, San Jose State University, San Francisco State University, the Northern California Geological Society, the American Association of Petroleum Geologists, California Council of Geoscience Organizations, Sonoma State University, U.C. Santa Cruz, U.C. Davis, the Association of Engineering Geologists, the Helatite Field Club at UCSC, the Peninsula Gem & Geology Society, and Northwest Geological Society. May the Fourth, 2018, Pick and Hammer "Club"—A gathering at Moffett Field to enjoy an evening of USGSers poking fun with story and song at ourselves, the bureaucracy, and our great science. February 13, 2018, Tom Brocher, USGS Earthquake Science Center, "Are We Still Seeing Aftershocks from a Large 1872 Earthquake in Central Washington?" 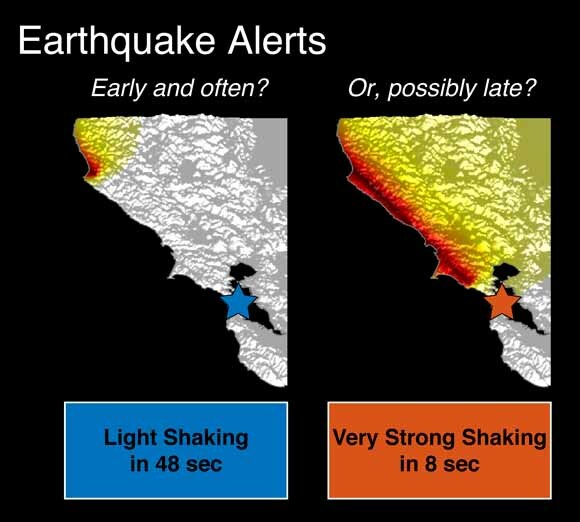 October 17, 2017, Chet Wrucke, Bob Wrucke, and Ted Sayre, "The Mystery of the San Andreas Fault in Portola Valley, Calif."
March 14, 2017, Mark Stelten, USGS Volcano Science Center, "The Timing and Hazard Implications of Volcanism in Northern Harrat Rahat, Kingdom of Saudi Arabia"
February 23, 2017, David Rumsey, David Rumsey Map Center, "Tour, presentation, and fellowship; joint meeting with the Northern California Chapter of The Explorers Club"
Tuesday, November 8, 2016, Walter Mooney, USGS Earthquake Science Center, "Birth of an Ocean: The Origin of the Red Sea"
June 14, 2016, Andrew Michael, USGS Earthquake Science Center, "International Aftershock Forecasting: Lessons from the Gorkha Earthquake"
May 10, 2016, Sarah Minson, USGS Earthquake Science Center, "Smartphone-Based Earthquake Early Warning in Chile"
March 8, 2016, Tiziana Vanorio, Stanford Rock Physics Laboratory, "Cementing Roman Concrete to a Caldera—Rock physics of fibrous rocks akin to Roman concrete explains uplifts at Campi Flegrei Caldera"
January 12, 2016, Donald R. Lowe, Stanford School of Earth, Energy & Environmental Sciences and Gary R. Byerly, Louisiana State University, "The Terrestrial Record of a Prolonged Late Heavy Bombardment: Evidence of Giant Impacts from 3.5-3.2 Billion-Year-Old rocks in the Barberton region, South Africa"
November 10, 2015, Anne M. Sanquini, recently of School of Earth, Energy and Environmental Sciences, Stanford University, "Inspiring Earthquake-Resistant Construction in the Kathmandu Valley, Nepal"
October 6, 2015, Andrea Llenos, USGS Earthquake Science Center, "Assessing Earthquake Hazards in the Anthropocene—Induced Seismicity in the Central and Eastern U.S."
May 19, 2015, Kayla Iacovino, USGS Volcano Hazards Team, "Linking Subsurface to Surface Degassing at Active Volcanoes Using Thermodynamics and a Simple Mixing Model"
March 10, 2015, Greg Stock, National Park Service, "New Tools for Understanding and Mitigating Rockfalls in Yosemite National Park"
February 10, 2015, Seth Burgess, U.S. Geological Survey, "Using High-Precision Geochronology to Test the Link Between Magmatism and Mass Extinction"
January 13, 2015, Felipe Aron, Stanford School of Earth Sciences, "Breaking the Forearc with Megathrusts"
December 9, 2014, Tim Dawson, California Geological Survey, "The August 24, 2014 South Napa Earthquake: Mapping an Earthquake Surface Rupture in the Digital Age"
November 11, 2014, Kimberly Blisniuk, San José State University, "The Southern San Andreas Fault: Earthquakes, Slip Rates and Quaternary Kinematics of Southern California"
May 13, 2014, Eitan Shelef and George Hilley, Stanford University, "Randomness and Order in Branched Channel Networks"
April 8, 2014, Manny Gabet, San Jose State University, "Mima Mounds Have A Biotic Origin—New Model"
March 11, 2014, Cal Stevens, San Jose State University, Paul Stone, U.S. Geological Survey, and Richard Blakely, U.S. Geological Survey, "Interpretations and Speculation on the Structural Development of Owens Valley"
February 11, 2014, David Shuster, U.C. Berkeley Department of Earth and Planetary Science -and- Berkeley Geochronology Center, "Using Helium-Based Thermochronology to Quantify Topographic Evolution Through Space and Time"
January 14, 2014, Patricia McCrory, U.S. Geological Survey, "Siletz-Crescent Forearc Terrane Revisited—Does a New Kinematic Model Solve an Old Puzzle?" November 14, 2013, Harry Cook, U.S. Geological Survey, "Evolution of the Western North American Paleozoic Passive-Margin Carbonate Platform Through Time and Space and Its Large Reserves of Carbonate-Hosted Gold Deposits"
May 14, 2013, Mark Zoback, Benjamin M. Page Professor, Department of Geophysics, Stanford University, "Opportunities and Challenges of Producing Natural Gas from Organic-Rich Shales"
April 9, 2013, Trevor Dumitru, Department of Geological and Environmental Sciences, Stanford University, "Three Stories About Episodic Accretion of Sediments and the Long-Term Growth of the Franciscan Accretionary Prism"
March 12, 2013, Carl Wentworth, U.S. Geological Survey, "The Quaternary Santa Clara Valley, California: Stratigraphy, Structure, and Problems"
February 12, 2013, James J. Rytuba, Victoria E. Langenheim, and Daniel N. Goldstein, U.S. Geological Survey, "Effects of the Paso Robles Geothermal System on Water Quality and Availability in the Paso Robles Groundwater Basin, California"
December 11, 2012, Christopher D. Henry, Nevada Bureau of Mines and Geology, University of Nevada, Reno, Nevada, "Cenozoic Far-Traveled Ignimbrites, Paleotopography, and Extension in the Great Basin"
November 13, 2012, Paul Hsieh, U.S. Geological Survey, "The Science Behind the Taming of the Deepwater Horizon Oil Spill"
October 9, 2012, Naomi Matthews, U.S. Geological Survey, "Tracking Magmatic Evolution at Long Valley Caldera through Zircon Geochronology and Geospeedometry"
May 8, 2012, Matty Mookerjee, Department of Geology, Sonoma State University, "Three-Dimensional Thrust Wedge Deformation: Integrating Field Analysis with a Kinematic-Based Mathematical Model for the Moine Thrust Zone, NW Scotland"
April 10, 2012, Mark Goodwin, Museum of Paleontology, U.C. Berkeley, "Whatever Happened to Torosaurus? Extreme Cranial Ontogeny in Late Cretaceous Dinosaurs"
March 6, 2012, Sandra J. Carlson, Department of Geology, U.C. Davis, "Crowns and Stems: What Exactly is a Brachiopod?" February 7, 2012, Manoochehr Shirzaei, Berkeley Seismological Lab, U.C. Berkeley, "Spatiotemporal Model of Creep on the Hayward Fault Inferred from Joint Inversion of 18 Years InSAR Time Series and Surface Creep Data"
January 10, 2012, David Finlayson, U.S. Geological Survey, Pacific Coastal and Marine Science Center, Santa Cruz, Calif., "Modern Seafloor Mapping at the USGS"
December 13, 2011, Jessica Lacy, U.S. Geological Survey, "Interactions Among Eelgrass, Currents, and Waves in Puget Sound"
November 8, 2011, Jonathan Hendricks, San Jose State University, "Integrating Paleontological, Morphological, and Molecular Sequence Data to Reconstruct the Phylogenetic Positions of Extinct Species"
October 4, 2011, Jonathan A. Warrick, U.S. Geological Survey, "The Largest Dam Removal in U.S. History—Observations from the Elwha River, Washington"
June 7, 2011, Presidential Address, Jon Hagstrum, U.S. Geological Survey, "Berringian Megafaunal Extinctions at ~37 ka B.P.—Are Fe-Ni-S Particles Embedded in Late Pleistocene Tusks and Skulls Related to an Extraterrestrial Event?" May 10, 2011, Jorge Vazquez, U.S. Geological Survey, "Durations of Magma Storage and Evolution at Large and Small Silicic Volcanoes"
April 14, 2011, Richard Nevle, Bellarmine College Preparatory and Santa Clara University, "Neotropical Human-Landscape Interactions, Fire, and Atmospheric CO2 During European Conquest"
March 8, 2011, Michael Sawlan, U.S. Geological Survey, "Unraveling the Stratigraphy and Genesis of the Grande Ronde Basalt, Columbia River Basalt Group, Using New, High-Quality Geochemical and Paleomagnetic Data from Selected Sections Across the Columbia Plateau and into the Columbia River Gorge"
February 8, 2011, Stephen Self, The Open University, Milton Keynes Campus, UK, and U.S. NRC, "Emplacement of Continental Flood Basalt Lava Flow Fields"
January 11, 2011, Jessica Oster, Stanford University, "Reconstructing Precipitation Variability in California Using Sierra Nevada Speleothems"
November 9, 2010, Darcy Ogden, Scripps Institution of Oceanography, "Rockets Made of Rocks?, What Jet Engines Can Teach Us About Explosive Volcanoes"
October 5, 2010, James G. Moore, U.S. Geological Survey, "Native American Granite Cisterns in the Sierra Nevada"
June 1, 2010, Presidential Address, Vicki Langenheim, Geology and Geophysics Science Center at the U.S. Geological Survey, "Unraveling the Structural Knot in the Southern San Andreas Fault"
May 11, 2010, Julie Fosdick, Department of Geological & Environmental Sciences at Stanford University, "Linking Fold-Thrust Belt Deformation and Exhumation to Foreland Basin Evolution: A Traverse of the Patagonian Andes"
April 13, 2010, David L. Wagner, California Geological Survey, "The Oak Creek Debris and Mudflows of July 12, 2008; Inyo County, California"
March 9, 2010, Robin Stewart, U.S. Geological Survey Water Resources National Research Program, "Understanding the Influence of Food Web Dynamics on Mercury and Selenium Bioaccumulation in Nature"
February 9, 2010, Eric L. Geist, U.S. Geological Survey, "Tsunami Generation and the Curious Case of the M=8.1 2009 Samoa Earthquake"
January 12, 2010, Brian Hausback, Sacramento State University, "Sutter Buttes—Volcano in the Sacramento Valley"
December 1, 2009, Simon Klemperer, Stanford University, "Rupturing Continental Lithosphere in the Main Ethiopian Rift—A Hot Plume Meets a Cold Craton"
November 10, 2009, George Hilley, Department of Geological and Environmental Sciences at Stanford, "Topographic Response to Active Deformation in the Santa Cruz Mountains, California"
October 6, 2009, Jonathan D. Stock, U.S. Geological Survey, "Linking the Ridge to the Reef—Adventures in Hawaiian Geomorphology"
May 12, 2009, Joseph P. Colgan, U.S. Geological Survey, "Rapid Middle Miocene Collapse of the Sevier Orogenic Plateau in North-Central Nevada"
April 7, 2009, Dave Stonestrom, U.S. Geological Survey, "A Hydrogeological Perspective on Nuclear Waste—Tales from the Trenches (Hanford’s and Beatty’s)"
March 10, 2009, Richard B. Firestone, Lawrence Berkeley National Laboratory, "Mammoths, Meteorites and Supernovae"
February 3, 2009, Andrew P. Barth, Indiana University-Purdue University Indianapolis, "Assembling and Disassembling California: A Chronologic Framework for Proterozoic Crustal Evolution in Southern California"
January 13, 2009, Russell W. Graymer, U.S. Geological Survey, "Recent Observations and Calculations Regarding Earthquake Hazards in the East San Francisco Bay Area"
December 2, 2008, Tom Hanks, U.S. Geological Survey, "The Travels of Clyde Kluckhohn and the Photographs of James Hanks, 1927-1928: Repeat Photography, Virtual Repeat Photography, and Earth-Surface Change in the Photographic Era"
November 11, 2008, Howard Wilshire and Jane Nielson, "Of Geology and Human Wastes"
September 30, 2008, Tom Brocher, U.S. Geological Survey, "A Retrospective Look at the 1868 Hayward Earthquake"
June 10, 2008, Thomas E. Moore, U.S. Geological Survey, "Birth, Death, and Resurrection of the Brooks Range, Alaska: Structural Architecture of a Major North American Fold-And-Thrust Belt -- Presidential Address"
May 13, 2008, Jonathan T. Hagstrum, U.S. Geological Survey, "The Geophysical Basis of Avian Homing and Migration: Infrasonic Map Cues Coupled to the Atmosphere from Microseismic Waves"
April 8, 2008, Steve Kirby, U.S. Geological Survey, "Putting Some Fizz into Geofizzics: Plumes and Earthquakes"
March 11, 2008, Don Gautier, U.S. Geological Survey, "U.S. Geological Survey Circum-Arctic Resource Appraisal: Oil and Gas Resource Potential of the Highest Northern Latitudes"
February 12, 2008, Victoria Langenheim, U.S. Geological Survey, "Geophysical Vignettes from the Wine Country: What We've Learned about Basin and Fault Evolution"
December 4, 2007, Marty Grove, UCLA/Stanford Geochronology, "Evolution of the Colorado River: Culmination of a Major Cenozoic Transformation of SW North American Drainage Patterns"
November 13, 2007, Gary Fuis, U.S. Geological Survey, "The Plate Boundaries in Southern California and South Island New Zealand: New Observations and Implications for Plate Tectonics"
October 9, 2007, Jim Moore, Emeritus Scientist, U.S. Geological Survey, "Growth of Giant Potassium Feldspar Crystals in Sierra Nevada Granite"
June 5, 2007, Elizabeth Miller, Stanford University, "The Arctic Plate Tectonic Puzzle: A Russian Perspective"
May 8, 2007, Jake Lowenstern , U.S. Geological Survey, Scientist In Charge, Yellowstone Volcano Observatory, "Intrusion, Deformation and Degassing at the Yellowstone Caldera"
April 10, 2007, Jason Saleeby, CalTech, Pasadena, Calif., "Exhumation of the Deep-Levels of the Southern Sierra Batholith, Southern California"
March 13, 2007, Ross Stein, USGS Western Earthquake Hazards Team, Menlo Park, Calif., "Earthquake Hazards of Tokyo -- A Global Problem"
February 13, 2007, John Tinsley, USGS Western Earthquake Hazards Team, Menlo Park, Calif., "Sierran Caves and the Earth Sciences—Examples from Sequoia and Kings Canyon National Parks Including Images of Recent New Finds"
January 9, 2007, Andy Calvert, USGS Volcano Hazards Team, Menlo Park, Calif., "Dating the Three Sisters with High Resolution Ar/Ar"
December 5, 2006, J. Luke Blair, James Lienkaemper, Scott Haefner, Marco Ticci, USGS Earthquake Hazards Team, "Exploring Your Earthquake Hazards Using Google Earth"
November 7, 2006, Paul S De Carli, Senior Scientist Emeritus, SRI International (also Hon. Research Fellow, Earth Sciences, University College London), "Diamonds, Meteorites and the Origin of the Solar System"
October 10, 2006, Jeremy Hourigan, U.C. Santa Cruz: "'Roasted Flysh: A Kamchatkan Recipe for making Continental Crust' and other tales of the Russian Pacific"
Saturday, June 24, 2006, Carol Prentice and Bob McLaughlin, U.S. Geological Survey, led a field trip: "The 1906 Earthquake and the San Andreas Fault on the San Francisco Peninsula"
June 6, 2006, Ray E. Wells, U.S. Geological Survey, "Block Rotations and Earthquake Hazards in the Pacific Northwest"
May 16, 2006, Russ Dyer, Chief Scientist, Office of Civilian Radioactive Waste Management, U.S. Department of Energy, Las Vegas, Nevada, "Assessing the Long-Term Performance of a Geologic Repository at Yucca Mountain, Nevada"
April 11, 2006, Mike H. Carr, U.S. Geological Survey, "Water on Mars - what have we learned from the Mars Rovers?" March 14, 2006, George Plafker, U.S. Geological Survey, "New Evidence for the Source of the Devastating Banda Acheh Tsunami of 2004"
February 7, 2006, George Hilley, Stanford University, "Imaging slow moving landslides in the Bay Area using Synthetic Aperture Radar Interferometry Permanent Scatterer Analysis"
January 10, 2006, Barbara John, University of Wyoming, "Slow Spreading Mid-Ocean Ridges: One Last Frontier in Plate Tectonics?" December 13, 2005, Robert J. Stern, University of Texas at Dallas, "Evidence from Blueschists, UHP metamorphic terranes, and ophiolites that Plate Tectonics began in Neoproterozoic time (1000-542 Ma)"
November 8, 2005, Jonathan Payne, Stanford University Department of Geological and Environmental Sciences, "A Multi-Proxy Record of Recovery from the End-Permian Mass Extinction"
October 9, 2005, Rolfe Erickson, Sonoma State University Geology Department, "Granites in the Franciscan - The Field Trip"
June 7, 2005, Walter Mooney, U.S. Geological Survey, "The Great Sumatran Earthquake and Tsunami"
May 10, 2005, Rolfe Erickson, Sonoma State University Geology Department, "Granites in the Franciscan Complex, Cazadero Area, California"
April 12, 2005 , Mark Zoback, Stanford University and Mike Rymer, U.S. Geological Survey, "The San Andreas Fault: “The Lecture” -- (to be followed by “The Field Trip” in May)"
March 8, 2005 , John Wakabayashi, "Locally-Driven Tectonic Inversion and Other Phenomena Linked to Evolution of Step-Over Regions Along Strike-Slip Faults"
February 8, 2005 , Charlie Bacon, U.S. Geological Survey, "Mount Veniaminof, A Huge Volcano in the Aleutian Arc"
January 11, 2005 , Ted McKee, U.S. Geological Survey, "Geophysics, Geology, and 3-D Computer Simulation Used to Model the Silent Canyon Caldera, Nevada Test Site". This meeting was also an "Honor-Howard-Oliver" fest. Andy Griscom came out from retirement in Massachusetts for this. December 14, 2004 , James Moore, U.S. Geological Survey, "Clarence King and the Lure of Mount Shasta" and Michael Diggles, U.S. Geological Survey, "Peninsula Geological Society: 50th Anniversary"
November 9, 2004 , George Plafker, U.S. Geological Survey, "A Look Back at the Great M 9.2 Alaska Earthquake of March 27, 1964: What was learned about Arc Tectonics"
October 12, 2004 , Bruce Rogers, U.S. Geological Survey, "Karst and Cave Development in the Yukatan"
September 14, 2004 , Thomas Mohr, Santa Clara Valley Water District, "Groundwater Protection in the Santa Clara Valley - the Role of Geology"
May 15, 2004, Steve Edwards, Director of the Regional Parks Botanic Garden in Berkeley, led a field trip to the Robert Sibley Volcanic Regional Preserve in the Berkeley Hills. May 11, 2004 , Barbara Bekins, U.S. Geological Survey, "Hydrogeology and the Weak Nature of Plate Boundary Faults"
April 3, 2004 , Hilde Schwartz, U.C. Santa Cruz, led a field trip to the Panoche and Tumey Hills, NW San Joaquin Valley. 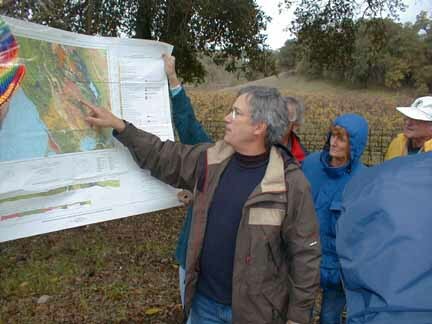 March 16, 2004, Joyce Blueford, Math/Science Nucleus, "Earthquake History Preserved in Tyson Lagoon: A New Environmental Wetland Center that Happens to be Right on the Hayward Fault"
February 10, 2004, David John, U.S. Geological Survey - "Hydrothermal Alteration on Active Cascades Volcanoes: Applications to Volcanic Hazards"
January 13, 2004, Hilde Schartz U.C. 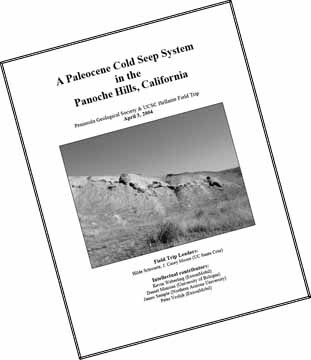 Santa Cruz - "When Tube Worms Ruled the Great Valley: Ancient Cold Seep Deposits and Chemosynthetic Communities in the Panoche and Tumey Hills, NW San Joaquin Valley"
December 16, 2003, John Stockwell - "The Formation of Thundereggs"
November 11, 2003, Greg M. Stock, U.C. Santa Cruz - "Determining the Pace of Landscape Evolution in the Sierra Nevada, California, Using Cosmogenic Dating of Cave Sediments"
June 3, 2003, Robert Christiansen, U.S. Geological Survey, Presidential Address: "A Lithospheric-Interaction Model for the Yellowstone and Newberry Melting Anomalies"
May 13, 2003, Cindy Heazlit, Hawaii Speleological Survey - "Hawaii Lava Tubes - A Tour of Discovery"
April 8, 2003, David Schwartz, Tim Dawson, Dave Keefer, and Robert Kayen, U.S. Geological Survey - "The November 2002, Denali Fault Earthquake: Was This Alaska Shock a Preview of California's Next 'Big One'?" March 11, 2003, Catherine W. Skinner, Yale University - "Medical Geology"
February 11, 2003, C. Page Chamberlain, Stanford University, Dept. of Geological and Environmental Sciences - "Late Cenozoic Topographic History of the Western United States - as Seen Through Stable Isotopes"
January 14, 2003, Michelle Coombs, U.S. Geological Survey - "New Insights into Hawaiian Volcanoes: A Submarine Perspective"
December 3, 2002, Herman Karl, U.S. Geological Survey - "Beyond the Golden Gate-Oceanography, Geology, Biology, and Environmental Issues in the Gulf of the Farallones"
November 12, 2002, Charlie Bacon, U.S. Geological Survey - "Volcanoes, Landslides, and the Water Level in Crater Lake, Oregon"
October 15, 2002, Jessica Murray, Stanford University Geophysics, "Testing Time-Predictable Earthquake Recurrence by Direct Measurement of Strain Accumulation and Release"
June 11, 2002, Amos Nur, Stanford University Dept. of Geophysics, "What's new in Earthquakes and Archaeology"
June 1, 2, and 3, 2002, Gary Ernst (Stanford University) and Mike Diggles (U.S. Geological Survey) led a three-day field trip to the White-Inyo Range in Mono and Inyo counties on the eastern edge of the Owens Valley in eastern California. This link goes to the field guidebook and a photo essay. 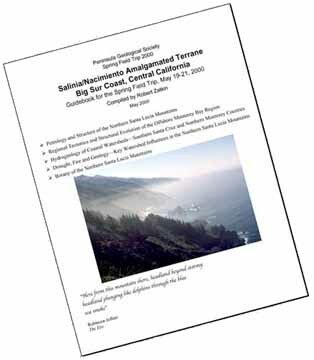 May 14, 2002, Gary Greene, Moss Landing Marine Lab (CSU system), "Recent Perspectives on Submarine Canyon Formation and Evolution"
April 9, 2002, George Brimhall, U.C. Berkeley Dept. of Earth and Planetary Science, "Digital Geological Mapping: Revolution or Regression?" March 12, 2002, Stephanie Prejean, Stanford University Dept. of Geophysics, "The Interaction Of Magmatic And Tectonic Processes in the Long Valley Caldera, Eastern California"
February 12, 2002, Jake Lowenstern, U.S. Geological Survey, "Uncovering the Buried Secrets Beneath Medicine Lake Volcano"
January 8, 2002, Mark Zoback, Stanford University Dept. of Geophysics, "Force-Limited Lithospheric Deformation: Constraints Imposed by Crustal Strength and Lithospheric Rheology"
December 4, 2001, Cal Stevens and Paul Stone, "Late Paleozoic and Triassic tectonic events in east-central California: precursors to development of the Sierran magmatic arc"
November 13, 2001, Jim Ingle, "History of the Gulf of California: evidence from sediments, subsidence, and Steinbeck"
October 16, 2001, Gary Ernst "Petrotectonic evolution of the Mount Barcroft area, central White Mountains, easternmost California"
June 5, 2001, Don Gautier "The energy crisis and the availability of oil and gas"
May 1, 2001, Jim Calzia, "SWEATing the details: Stratigraphic ties between Death Valley and Antarctica?" 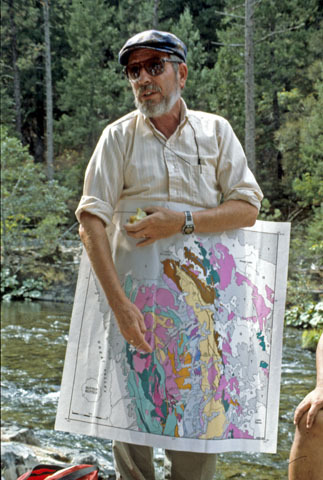 April 10, 2001, Don Lowe, "Geologic evidence for large impacts on the pre-3.0 Ga Archean Earth"
March 6, 2001, Bob Christiansen, "Volcanic Evolution of Mount Shasta"
February 13, 2001, David Howell, Donald Kennedy, Robyn Dunbar, Suzanne Frew, and a troika of interns, "Crowding the Rim-how population growth and economic globalization enhance the risk of natural hazards...and what we plan to do about it!" January 9, 2001, Atilla Aydin, "Puzzles left behind by the 1999 Turkish earthquakes"
December 5, 2000, Charlie Bacon, "Aniakchak Volcano, a Holocene caldera in the Aleutian arc"
November 7, 2000, Gary Ernst, "Geology and petrochemistry of the Sawyers Bar area, central Klamath Mountains: evolution of an oceanic island arc"
October 3, 2000, David Howell, "Earth nectar-the geology and wines of Napa Valley"
May 16, 2000, Pam Matson, "Global Change in the Nitrogen Cycle: Implications for tropical soils and ecosystems"
April 18, 2000, Jim Moore, "Exploring the Highest Sierra"
January 5, 1999, Chet Wrucke, U.S. Geological Survey/PGS immediate past President: Presidential Address, Once upon a time I went looking for the Denali fault of Alaska. What did I find? 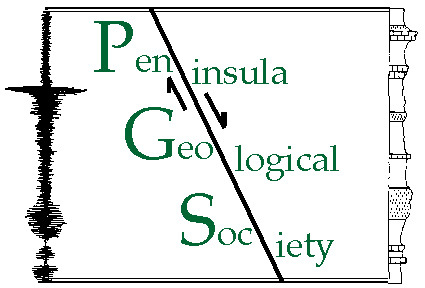 The program for the Peninsula Geological Society Ben Page Seminar has comprised the April and May meetings, the May field trip, and we have eight promised papers and one map for the festschrift. The papers will be published in the International Geology Review. 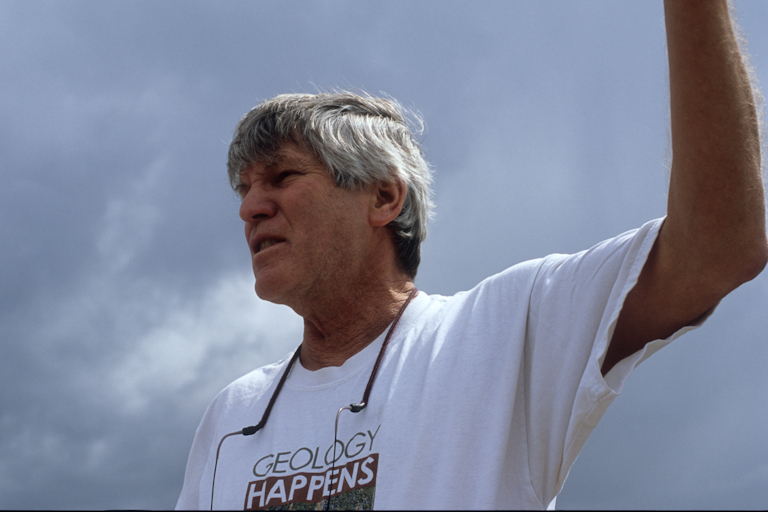 The seminars and papers will be a great tribute to Ben's geologic heritage. 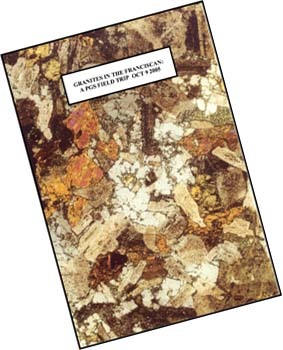 May 30, 1998 Field Trip, "New views on Franciscan structure and metamorphism in the Lick Observatory Quadrangle," With Clark Blake, University of Western Washington and Carl Wentworth, USGS, Menlo Park. 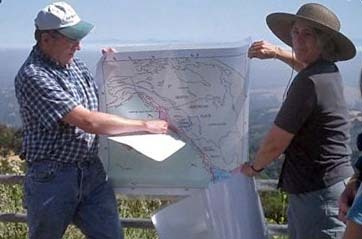 May 19, 1998, Tom Brocher, USGS, "Synthesis of the Deep Crustal Seismic Structure in the San Francisco Bay Area, " and Simon Klemperer, Stanford, "Crustal Structure of the Great Valley and the California Coast Ranges"
April 14, 1998, Earl Brabb, USGS, "Bay Area Landslides," Bob McLaughlin, USGS, "Neotectonic Deformation of Cretaceous-Paleocene Tectonic Wedge, San Francisco Bay Block, Spirited Conversations with Ben"
March 10, 1998, George Thompson, Stanford Geophysics, "Deep mantle plumes and geoscience vision"
February 10, 1998, Jeff Mount, U.C. Davis, "Flooding in the West: Lessons Learned... Yet Again?" January 13, 1998, Dave Des Marais, NASA/Ames, "Astrobiology - Understanding life in the Universe"
Septermber 16, 1997, David Howell (USGS), Robert Jachens (USGS), Carl Wentworth (USGS), Todd Fitzgibbon (USGS) Clara Chan, (USGS & Stanford), Michelle Roberts (USGS and UCSC), and Skip Pack (Dynamic Graphics, Inc.), "Geologic Mapping for the 21st Century: Buck Rogers to R2D2:GPS/GIS/continuous 3-D geology/and more!" June 3, 1997, Ray Wells (USGS), "Regional kinematics, crustal faults, earthquakes, and segmentation of Cascadia" and Rick Blakely (USGS), "Geophysical evidence for crustal faulting and earthquake hazards in the Portland Basin and Willamette Valley"
May 19, 1997, Amos Nur (Stanford Geophysics), "Earthquakes and archaeology in the eastern Mediterranean and ancient Near East"
April 10, 1997, Walter Mooney (USGS), "Global model of crustal structure and growth" and Gary Fuis (USGS), "Structure and evolution of the Brooks Range"
March 6, 1997 , Steve Graham (Stanford Geology) and Lisa Lamb (Stanford Geology), "Geologic architecture and tectonic accretion of Mongolia"
Feb. 18, 1997, W.G. Ernst (Stanford Geology), "Eurasian ultrahigh-pressure collisional belts" and J.G. 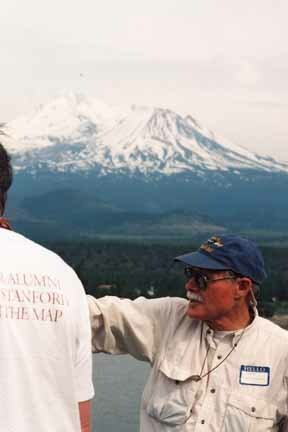 Liou (Stanford Geology), "New work on the Dabie-Sulu UHP terrane"
January 9, 1997 lecture Don DePaolo (U.C. Berkeley), "Hawaiian scientific drilling project" and Mark Zoback (Stanford Geophysics), "Testing fundamental theories of earthquake mechanics through fault-zone drilling"
November, 1996 lecture Simon Clemett, "PAH (polycyclic aromatic hydrocarbon) from a Martian meteorite" and Jack Farmer, "Implications for life in the solar system"
October, 1996 lecture Magmatic Arc Lower Crust and Volcanism in the Southern Cascades - What's Going On? March, 1996 lecture on Minerals Issues. October 9-10, 1982 field trip on a geologic transect of the northern Sierra Nevada along the North Fork of the Yuba River by Elwood R. Brooks and Richard A. Schweikert. Web-Counter visitor number since April 25, 1996. Dues have been discontinued as we have no expenses; email Mike Diggles to be a PGS member and that will put you on the email list for any events that people may organize. Created by: Mike Diggles, Webmaster, PGS.